Through the years, your driveway receives a lot of abuse. Cars leak their oil and fluids on them while children spill their juice, popsicles, and lunch. From all this wear and tear, your driveway can begin to look dingy, dull, and aged. Bring it back to life with eSquared Asphalt Maintenance’s quick and easy driveway pressure washing available in Waco and Temple, TX. 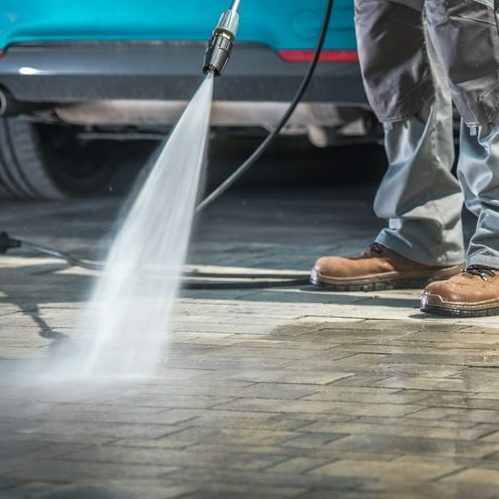 Our professionals will perform a complete cleaning of your driveway, removing vehicle stains, tree sap, and even gum, grime, and hard to clean scuffs. When you’re looking for a simple way to revive your driveway, call our professionals at 254-716-8685 to schedule your driveway pressure wash around Waco and Temple, TX. A driveway can define the look of your entire home. Regardless of how nice the rest of your landscape and exterior, a soiled driveway can create the wrong impression. This can not only lower curb appeal but decrease the value and asking price of a marketed home. Both casual observers and interested buyers will definitely appreciate the cleanliness that a nice driveway imparts. A simple pressure wash can eliminate stains and soiled areas on your driveway and exterior walls without harsh chemicals that can be harmful to your family. This process can also wipe away mold, sap, and other natural elements that can not only cause an unsightly blemish to your home but can be a fall hazard. This type of driveway washing also completely removes any layers of chemicals or toxins that polluted city air can leave on your concrete causing premature deterioration. Driveway washing gets down into the smallest cracks of your concrete to remove debris and dirt that can cause cracks to wear and widen which can help your concrete stay strong and intact longer and saving you money on future repairs. Around Waco and Temple, TX, driveway pressure washing can be very beneficial in removing all stains, debris, and chemicals from your concrete driveway which can not only raise the curb appeal and value of your home but offer a safer, longer lasting driveway for your family’s use. Call our professionals today at 254-716-8685 to schedule your appointment for driveway pressure washing anywhere in the Waco and Temple, TX area and return your driveway to its original beauty. Updated on March 21, 2019 at 1:50 pm by eSquared Asphalt Maintenance.